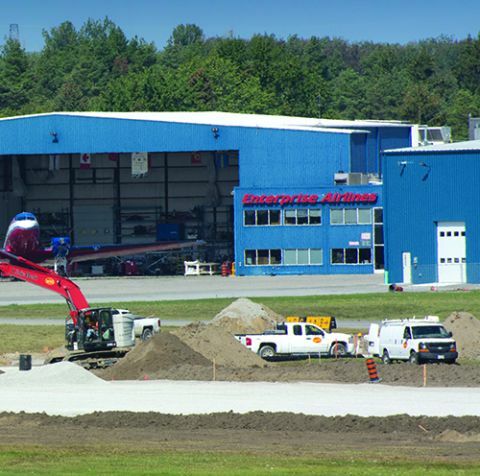 After a series of surface-level fixes throughout the years, it was high time the runways and related infrastructure at Oshawa Executive Airport (YOO) in Ontario received the upgrades they truly required. The only question for the project team was how to make up for nearly 80 years of patchwork solutions in just 35 days. “Getting as much done as possible in advance was key,” explains Airport Manager Stephen Wilcox. The plan was to replace the entire aging runway, all subsurface drainage and lighting/electrical infrastructure, which was also reaching the end of its lifecycle. The original work scope also included new runway end safety areas made out of grass. General Contractor: Metric Contracting Services Corp. Instead, however, YOO chose to pave the safety areas to increase safety in the event that a plane overruns the runway. It also opted to replace two portions of taxiways to avoid future disturbance on the main runway for eventual taxiway renovations. In total, the comprehensive improvements cost $6 million. The final work scope called for full-depth excavation of 4,250 feet of runway, including the removal of topsoil and installation of new drains. From there, crews built the runways back up with conventional standards based on pavement loadbearing. The project also took on the next wave of safety regulations on the horizon from Transport Canada. Whenever an airport undergoes major reconstruction, it triggers the next highest standard of safety regulations, notes Wilcox. The additional work, in turn, expanded the total amount of paving for the project to 4,750 feet, including taxiways, intersections and the first 250 feet of each threshold runway end safety areas. In tolal, general contractor Metric Contracting Services Corp. moved about 100,000 cubic meters of earth/topsoil, placed and compacted 110,000 metric tons of new granular material, paved 14,000 metric tons of asphalt, installed 2,100 linear meters of storm sewers with 49 structures, and completely upgraded and replaced the existing runway lighting. Stakeholders realized the second option made the most sense, even if it would be a difficult pill to swallow, businesswise. YOO logs 70,000 movements annually, including 5,000 corporate flights, and is home for two flight training schools and various recreational pilots. The impending closure of a nearby general aviation airport also steered YOO management toward the more expedient Option 2. Traffic at YOO was expected to jump by more than 30,000 annual aircraft movements when Buttonville Municipal Airport (YKZ) closed in fall 2017. As is turned out, YKZ remained open longer than originally anticipated; but YOO stands ready to accommodate its traffic. Local news media report that YKZ is now scheduled to remain open through spring 2023. In order to make sure the project was completed on time, the team focused on staying ahead of schedule. One major milestone was stockpiling and staging 48,000 metric tons of granular material and managing the equipment and trucks to pull that off. Early in the planning stages, airport personnel conducted a thorough analysis of historical weather data to determine the best time of year for airfield construction. The ideal window was August, because it is typically the driest part of the year. But August is also the busiest for the airport; so YOO elected to break ground in September. Wilcox acknowledges that even September is a busy time of year for airport traffic, but the job couldn’t be pushed to October out of concerns for inclement weather and freezing ground conditions. Spring was out of the question due to the likelihood of rain that would saturate the ground. Metric Contracting dedicated extra resources and worked crews in 12-hour shifts to meet YOO’s tight deadline. “We basically brought the right tools to do the job,” explains Marco Parmegiani, district manager for the company. He notes that Metric could have had crews working 24 hours by including weekends, but 12-hour stints gave the team some margin for error in case things went awry. Wilcox and his team also identified components of the project that could be accomplished well ahead of groundbreaking without impacting airport operations. For example, in order to build the paved runway safety areas, crews had to move the 100-year flood plain basin. Wilcox likens relocating the 50-foot-deep, 75-foot-wide ditch to moving a river. Getting this complex task out of the way early helped the rest of the schedule, explains Wilcox. The airport also had to move fencing surrounding the perimeter of the property to make way for construction work. 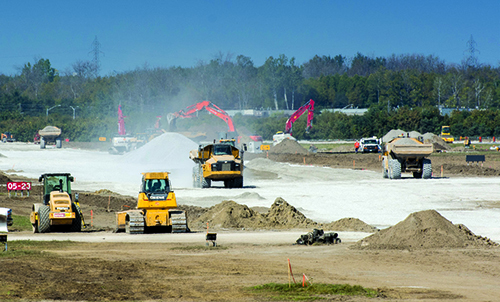 During the design phase, project planners intended to have crews remove all runway soils offsite. However, workers were able to separate the materials and use some to fill in the flood basin. Excavated materials were also used to create a large earth berm. Airport users are sensitive to the noise they create and want to be respectful of their neighbors, explains Wilcox. With that in mind, YOO has built a total of four earthen berms to mitigate ground noise associated with aircraft activity. The new sound barrier is 3/4-mile long and runs parallel with houses that back onto the airport. Any time there is massive construction on a 77-year-old jobsite, there are bound to be surprises beneath the surface. At YOO, crews encountered unexpected infrastructure during the excavation process. Crews discovered drainage pipes and asphalt that were put in place but never commissioned under the taxiway tie-in, just beneath the current asphalt. As far as Wilcox could tell, the pipes were laid in 1997 when the airport built the taxiway, and crews misjudged the grading. Instead of rectifying the mistake, workers apparently built on top of the grade as it was. “It was literally brand new, just 2 feet underground, in the area of the storm sewer, built exactly to spec,” Wilcox relates. Crews also discovered soft subgrade, but wet soil conditions were dealt with efficiently and expediently and thus proved to be a minor issue. Metric simply let the problem areas dry naturally, and the project carried on with minimal delays and added costs.